The Archaeological Survey in Numbers – 2018 Update! 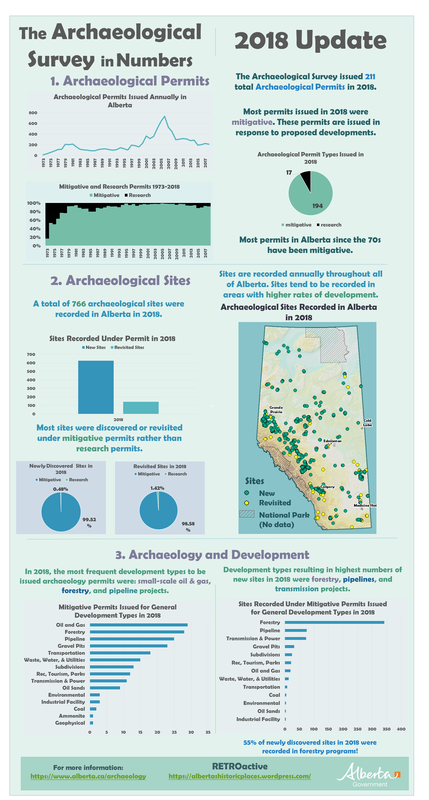 This week’s post is an update on archaeological project and site data for 2018 from the Archaeological Survey. Click the image below the see the full size. Disclaimer: the archaeological site counts for 2018 are not final. They are constantly being updated as consultants and researchers submit their reports to the Archaeological Survey. Editor’s note: This post is part two of the previous weeks’ article. Treaty Six territory in Alberta hosts diverse Indigenous communities; however their histories are still relatively unknown. In the 1980s, Indigenous Studies looked more at the Indian politics (Treaty), and government relations and women were often left out of the patriarchal and hegemonic discourses. Anthropology is where I found I could apply a study of Plains Cree culture. Eurocentrism and ethnocentric discourse in Alberta have entrenched a cultural lens that is built on exclusion and homogeneity of Indigenous groups. Anthropologists such as David Mandelbaum (who studied the Plains Cree in Saskatchewan) and Clark Wissler (who studied Blackfoot culture) used a selective process that was resonant of the cultural centres and cultural diffusion approaches, and that would in turn be used to interpret and influence a way of understanding the Indigenous life western Canada. In 2008, I began work with the Royal Alberta Museum (RAM) as the Aboriginal Liaison Officer, handling repatriation applications for the Blackfoot. Within this time frame, I also began to care for Cree collections and researched sacred objects in the context of Little Hunter’s Band. While completing my Masters of Arts in Integrated Studies (MAIS) that laddered the Heritage Resource Management Program through Athabasca University, I began exploring the oppression and subjugation of the Plains Cree within the context of Heritage and Cultural Management. My research is informed by Linda Tuhiwia Smith, author of Decolonizing Methodologies: Research and Indigenous Peoples, as well as Paulette Steeves’ work on decolonizing education, culture and heritage, both of whom illustrate ways to approach tangled histories often seen in places where oppression and subjugation of Indigenous peoples occurs. Editor’s note: This is part one of a two-part series exploring the experience of the Plains Cree through both pre-treaty and contemporary experiences. Part two will be posted next week. I am an Indigenous researcher. I apply interdisciplinary research approaches (Indigenous studies, anthropology, archaeology, paleontology, history and decolonization) and a Plains Cree (Nehiyawiwin) praxis to my historical analysis. To aid in understanding the Alberta landscape, I implement traditional Nehiyaw ontology, as well as epistemology through oral histories and legends. I have worked in various institutions and on numerous projects, conducting research on the objects and artifacts in collections. I am interested in this work as means to decolonize, through Nehiyaw interpretations about social, sacred and political spaces in Alberta. My Plains Cree world view is “pimacihowin-nehiyaw life, living and experience’. Today, traditional Nehiyaw life would not be possible without the resilient generations before me, that were challenged with Indian policies of assimilation, subjugation and oppression. Sadly, this oppression continue today in the area of culture and heritage in Alberta. The race to claim Canada’s west involved colonial expansion, building of the Canadian Pacific Railway (CPR) and treaties with First Nations. The expediency of this process, and the ramifications of it, are still not fully understood to this day. The use of anthropology and archaeology to interpret the past and collect culture, in a Eurocentric and ethnocentric way, has helped to create the land and heritage issues that still to this day contribute to the marginalization of First Nations in Treaty Six. I belong primarily to Little Hunter’s/Onchiminahos (pronounced in Cree as Oonah-tah-mee-na-hoos) Band, as well as the Blue Quills Band. These two bands, along with two others, were forcibly amalgamated into one reserve after the signing of Treaty at Fort Pitt in September 9,1876. While Chief Little Hunter is mentioned in a few references after this treaty, his contributions are not well-documented in history books or academia. A similar experience had occurred with Chief Blue Quills, whose people were stripped of the lands they occupied. I spoke with a male relative and he suggested that both Chief Little Hunter and Chief Blue Quills were aggressive leaders, and I believe that this aggression were acts of resistance against Indian policy. However, in the years that followed the treaty at Fort Pitt, numerous government policy, laws and initiatives would further the subjugation of Indigenous peoples, outlawing the practice of ceremony and cultural traditions. This created the mechanism by which many Treaty Six communities in Alberta and Saskatchewan would become marginalized from the colonial society (past and present). In the summer of 1886, surveyor J. C Nelson of the Department of Indian Affairs surveyed the Saddle Lake reserve (Onihcikiskowapowin, the image on the lake) for the four bands: James Seenum (originating from Lac La Biche), Bears Ears (Muskegwatic) or Wasatnows Band, Onchiminahos (Little Hunter’s Band), and the Blue Quills Band. On July 28, 1886, surveys were completed the for the reserves of Goodfish (Pakan, Whitefish) Lake I.R No. 128 and Wasatnow I.R 126(Big Bears Ear). Saddle Lake and Blue Quills (Egg Lake- present day Andrew) I.R 125 would be completed two years later. The final reserve survey was completed in 1887, and Order in Council P. C 1151 stated that Goodfish Lake maintained its own land base, while the other bands lived within the reserve boundaries of I.R 125. Goodfish Lake maintain their own tribal identity. Amalgamation was used as a tactic in other adjacent areas. The four bands comprising Maskwacis is a similar example, however, each maintain their own tribal identities. In what is now the City of Edmonton, Papaschase reserve was dismantled by Indian Department and many band members relocated to other Indigenous communities, including Maskwacis, Enoch, Saddle Lake and Beaver Lake . In the United States, the reservation period involved the displacement or dispossession of enemy tribes within the same reserve space (this was the case for the Shoshone and Arapahoe Nations). In the summer of 1886, surveyor J. C Nelson of the Department of Indian Affairs surveyed the Saddle Lake reserve. Image courtesy of Saddle Lake Cree Nation. Adding to the complexity was the implementation by government to control band membership. Henry Bird Steinhauer was an Ojibwa Methodist who lived with the Goodfish Lake Band and established his mission there, but later his family joined the Saddle Lake Band registry. Chief Little Hunter, leader of the Onchiminahos Band, lived in areas south of Bodo and Sounding Lake, but had associations to the Crow, Nakoda and Assiniboine tribes. The Peace Pipe, still used today in ceremony and other events, was used at treaty negotiations to illustrate commitment and relationship. Peace pipe agreement on the plains were held with the Assiniboine, Kutenai, Crow, Blackfoot and the Dene. Similar peace pipe treaties existed, but more research is needed to define the law and governance systems that were practiced on the plains. Traditional adoptive systems were also implemented within Plains Cree governance, such as that of “wahkohtowin,” which translates to all my relations. This practice existed between the Plains Cree, Assiniboine, Kutenai, Stoney, Crow, Sioux, Métis and Blackfoot. Traditional adoptions are still practiced today; many times I have witnessed these transactions between the Stoney and the Cree. The influx of diverse nations—through government tactics, forced amalgamations, reserve surrenders and/or marriage and adoption—had created tangled genealogies and cultural complexities not fully understood or captured in anthropological study. To fix this, we have to visit the experiences of the First Nations in Treaty. This process will illustrate the complexity and impact of colonialism on Plains Cree of Alberta. Onchiminahos Band was also dismantled prior to treaty. The building of the CPR, the signing of treaties and the political events and policy used to control band leadership is seen in Little Hunter’s case. Little Hunter’s membership relocated to different reserves, including Ministikwan First Nation in Saskatchewan, and Onion Lake Cree Nation on the border of Saskatchewan and Alberta.